Glycolysis is a vital stage in respiration, as it is the first stage glucose is modified to produce compounds which can go on to be used in the later stages, in addition to generating ATP which can be directly used by the cell. In this article, we will look at the steps of glycolysis, its relation to other pathways and clinical conditions related to glycolysis. Glycolysis is literally the ‘lysis’ (splitting) of glucose into 2 pyruvate molecules. It is very flexible and can interact with many other biochemical pathways as long as the necessary enzymes are present in the cell. Glycolysis is an anaerobic reaction (does not require oxygen) and in low oxygen conditions it is the only source of ATP (eg. ischaemia, high intensity exercise). It occurs in the cytosol of the cell. Further aerobic oxidation of pyruvate and NADH to produce energy requires mitochondria. In cells without mitochondria, anaerobic glycolysis is the only source of ATP (eg. red blood cells). It is regulated at the entry to the pathway and at the irreversible steps (1, 3 and 10). Dietary glucose – taken from the blood into cells (after meals). Glycogenolysis – glucose is released from the storage molecule glycogen in the liver into the blood for use by other cells (between meals). Other monosaccharides – galactose and fructose enter the glycolysis pathway in the liver at various levels via common intermediates. Glycogen in skeletal muscle cannot be fully broken down into glucose. This means it cannot leave the cell and can only feed into glycolysis within the skeletal muscle cells it is stored in. Various transporters (GLUT 1-4) transport glucose into cells. They have different kinetics and methods of regulation depending on the purpose of glycolysis in that cell. Energy investment phase – requires two ATP molecules to produce a very high energy intermediate (reactions 1-3). The molecules required to start this process are two ATP molecules, two NAD+ molecules and a glucose molecule. The net products of glycolysis are two NADH molecules, two ATP molecules and two pyruvate molecules. Glucose is phosphorylated by hexokinase. The negative charges trap it in the cell as polar molecules cannot pass the lipid bilayer unaided. 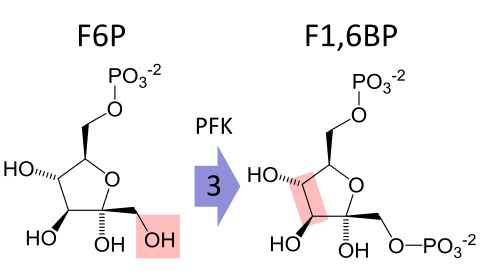 Phosphate is a high energy group so adding a phosphate group increases the energy of glucose making it more reactive. This allows the rest of glycolysis to occur. This reaction requires ATP and so is spontaneous and irreversible. It is therefore a regulated step. 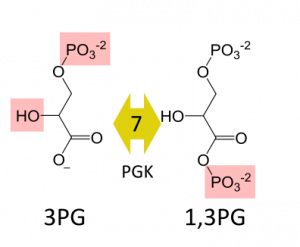 A common regulatory mechanism for this step is product inhibition, where the product generated, glucose-6-phosphate, goes on to inhibit the enzyme controlling this step, hexokinase. In the liver, glucokinase also catalyses this reaction. It has a higher Km (5mM cf. 0.1mM) so it works only at high blood glucose concentrations. This is important for increased glucose uptake by the liver after meals when glucose is high. Surplus glucose can then be converted to the glucose storage molecule glycogen in the liver. Fructose-6-phosphate is phosphorylated by phosphofructokinase-1. This creates an unstable molecule that will split spontaneously to form two 3 carbon molecules. This reaction requires ATP and so is spontaneous and irreversible. It is therefore a regulated step. 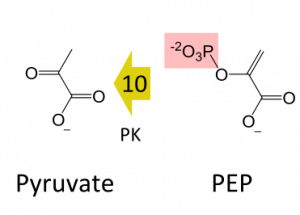 This reaction is allosterically inhibited by ATP and activated by AMP. This ensures glycolysis does not occur when the cell is in a high energy state as the purpose of glycolysis is to provide high energy molecules. This can also be considered as negative feedback. 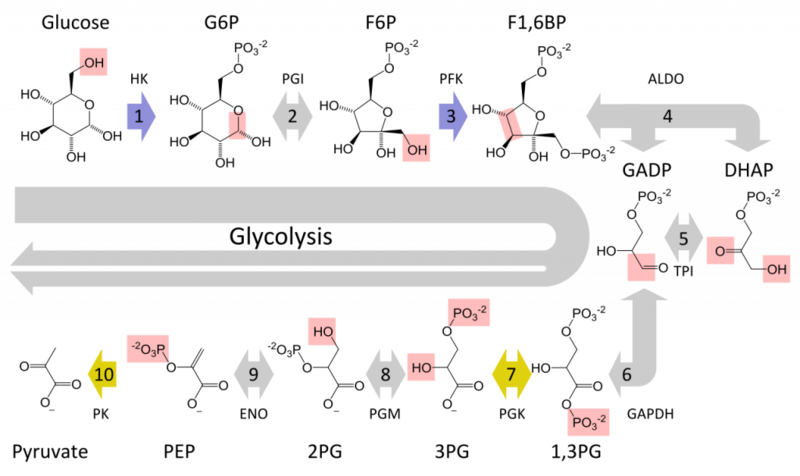 Phosphofructokinase-1 itself is phosphorylated and inhibited by glucagon, whilst insulin dephosphorylates and activates the enzyme. This ensures that when there is high blood glucose (such as after a meal) more glucose is broken down within cells. This is also the step of commitment to glycolysis. 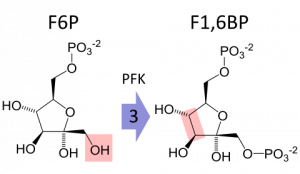 Once fructose-1,6-bisphosphate has been formed glycolysis has to occur and it cannot enter other pathways (such as glycogenesis or the pentose phosphate pathway). ATP is produced by transferring a phosphate group from a substrate in glycolysis to ADP. This requires a soluble enzyme and is called substrate level phosphorylation. Pyruvate is the end product of glycolysis under aerobic conditions. It is a high energy product as not much energy has been extracted from glucose. This lack of energy extraction is why glycolysis is very inefficient. ATP is produced by transferring a phosphate group from a substrate in glycolysis to ADP. This requires a soluble enzyme (Pyruvate Kinase) and is called substrate level phosphorylation. This step is irreversible and therefore is a regulated step. This phase uses NAD+ to produce NADH which would eventually deplete NAD+. Without NAD+ glycolysis cannot continue. Therefore, there must be a way to recycle it. NADH can be recycled to produce NAD+ by two mechanisms. The first is in the electron transport chain, which requires mitochondria and oxygen. The second is in the Cori cycle producing lactic acid. Pyruvate is a versatile molecule which feeds into numerous pathways. 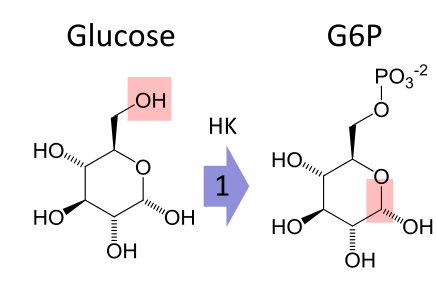 After glycolysis, it can be converted to acetyl CoA for complete oxidation by entering the citric acid cycle and oxidative phosphorylation. It can also be converted to lactate which enters the Cori cycle in absence of mitochondria or oxygen or used in ketogenesis where acetyl CoA can instead be used to make ketones when glucose levels are low. Finally, acetyl CoA can be used to make fatty acids in states of high energy. DHAP, an intermediate of glycolysis, can be converted to glycerol phosphate in the liver and adipose tissue. This can feed into biosynthetic pathways, such as triglyceride and phospholipid biosynthesis, which also recycles NADH. 1,3-BPG can also be converted to 2,3-BPG in red blood cells to alter the affinity of haemoglobin for O2. Excessive anaerobic glycolysis produces a lot of lactic acid. This can leave the cell and enter the blood stream. If the plasma lactate concentration exceeds 5mM blood pH will be lowered as buffering mechanisms are overwhelmed. This is called lactic acidosis and is potentially life threatening. This may occur due to a lack of NAD+ or because the enzyme that gets rid of lactate is deficient (lactate dehydrogenase deficiency). Tumours have been found to have a very high rate of glycolysis (the Warburg effect). This is advantageous to the tumour if it outgrows its blood supply as it can produce energy from anaerobic glycolysis faster. It is also clinically advantageous in the detection and treatment of cancer. PET scans show that radioactive glycolytic intermediates accumulate in cancer cells allowing detection. Drugs targeted at glycolysis are also used in the treatment of cancer in chemotherapy. An example is imatinib (Gleevec) which reduces the synthesis of hexokinase so that less glucose is trapped in the cell. Where does glycolysis occur in the cell? Which of the following is NOT a direct entry point to glycolysis? Which of the following transporters is insulin dependent? Which of the following transporters are found in all cells? Which enzyme, found in the liver, is responsible for phosphorylation of glucose? Which of the following molecules, once formed, commits it to glycolysis? Which of the intermediates in glycolysis are important for formation of 2,3 BPG in RBCs?